Fosfomycin trometamol was first described in 1969. It is a phosphonic acid derivative, which acts primarily by interfering with bacterial peptidoglycan synthesis. Fosfomycin enters bacteria by utilizing the L-α-glycerophosphate transport system, which is the major route of entry. There is also a secondary transport system, the hexose phosphate uptake system, which can be induced by glucose-6-phosphate. Once inside the bacterium, it acts as an analog of phosphoenolpyruvate and irreversibly inhibits the enzyme pyruvyl transferase, which catalyzes the first step of peptidoglycan biosynthesis. By blocking the action of this enzyme, fosfomycin inhibits cell wall synthesis. It has a broad spectrum of activity against aerobic Gram-positive and Gram-negative bacteria, including those that cause urinary tract infections (UTIs). In vitro studies show that, at concentrations achieved in the urine, most of the commonly encountered urinary pathogens, including vancomycin-resistant enterococci (VRE), are susceptible to fosfomycin. In most studies, >90% of strains of Escherichia More Details coli, Citrobacter diversus, Citrobacter freundii, Klebsiella oxytoca, Klebsiella pneumoniae, Enterobacter cloacae, Serratia marcescens, Proteus mirabilis, Proteus vulgaris, Providencia rettgeri, Pseudomonas aeruginosa, Enterococcus faecalis, and Enterococcus faecium were susceptible to fosfomycin., There have been several trials comparing fosfomycin with other antibiotics such as norfloxacin, ofloxacin, amoxicillin, amoxicillin-clavulanate, pefloxacin, pipemidic acid, and ceftriaxone for the treatment of uncomplicated UTIs in adult women in Europe. A review of these studies showed that at 1 week of follow-up, bacteriologic eradication rates were about 90% with fosfomycin and from 80% to 90% with the other drugs. There seems to be little cross-resistance between fosfomycin and other antibiotics commonly used to treat UTIs; thus, its efficacy is not affected by development of resistance to other antibiotics. Bacterial resistance to fosfomycin is usually chromosomally mediated. In rare instances, it may be plasmid mediated. Chromosomally mediated resistance occurs essentially because of mutations that interfere with these two transport mechanisms, resulting in reduced intracellular concentrations of the drug in the target bacteria. Since the first report of plasmid-mediated resistance to fosfomycin in S. marcescens in 1980, there have been reports of similar resistance in other bacteria including Serratia liquefaciens, K. oxytoca, K. pneumoniae, and E. coli. One of these plasmid-harbored genes has been characterized and is called the fos A gene. The protein encoded by the fos A gene brings about glutathione conjugation of fosfomycin, rendering it ineffective. The fos A gene has not been found in Gram-positive bacteria. Some Staphylococcus aureus and Staphylococcus epidermidis bear a different fosfomycin-resistance gene, fos B. The mechanism of resistance conferred by the fos B gene has not been determined. Fosfomycin can be administered orally with a convenient dosing schedule. Fosfomycin trometamol is available in the unusual form of sachets, each containing the equivalent of 3 g of fosfomycin. The powdered preparation has to be dissolved in cold water before being administered orally. There is an intravenous formulation too, but this is usually not available. The most common clinical setting for the use of fosfomycin is in the treatment of different types of UTIs. Studies have shown similar efficacy for a 3-g single dose of fosfomycin trometamol in the treatment of symptomatic and asymptomatic UTIs in pregnancy as compared with a 7-day course of nitrofurantoin, or a 7-day course of pipemidic acid, or a single dose of amoxicillin. From the available data, fosfomycin seems to be safe and effective as single-dose therapy for the treatment of uncomplicated UTIs in children., The antimicrobial and pharmacokinetic profiles of fosfomycin suggest that it might also be useful for the treatment of some cases of complicated UTIs caused by most urinary pathogens. It has also been used successfully to treat recalcitrant prostatitis caused by a VRE in a patient who wished to avoid intravenous therapy. In this instance, it was administered orally once every 3 days for 3 weeks, based on the fact that therapeutic levels of the drug are known to be present in the urine for at least 36–48 h after a single oral dose. Given the in vitro activity of fosfomycin against VRE, its long serum half-life, prolonged high-urinary concentrations in the urine, good penetration of the kidneys and prostate, and potential for convenient oral administration, it is another useful drug for the treatment of VRE UTIs. However, it should not be used in patients with complicated UTIs caused by obstruction that needs surgical intervention, because it cannot be expected to provide lasting clearance of bacteriuria in this situation. Oral fosfomycin has been used for prophylaxis in patients undergoing transurethral resection of the prostate as dual-dose therapy and has been shown to decrease the incidence of postoperative fevers and bacteriuria as compared with prophylaxis using amoxicillin and trimethoprim (TMP)-sulfamethoxazole (SMX). Most of the published literature on fosfomycin deals with the use of single doses of the oral preparation. Randomized studies have also shown a combination of intravenous fosfomycin and metronidazole to be effective for the prophylaxis of infection during elective and emergent abdominal surgery. The drug has been recently introduced in Indian market, so there are limited studies from India regarding the susceptibility profile of this comparatively nascent drug. The aim of the study is to find the in vitro susceptibility pattern of urinary isolates to fosfomycin and compare it with other commonly used antimicrobial agents. All 230 nonrepetitive urinary isolates during the period March 2014 to August 2014 were identified by microscopy, culture, and standard biochemical reactions and were tested for antibiotic susceptibility by modified Kirby–Bauer disc diffusion technique following the Clinical and Laboratory Standards Institute (CLSI) guidelines. Simultaneously, these isolates have also been tested for extended-spectrum β-lactamase (ESBL) by double-disc synergy test method, following the CLSI recommendations, using cefotaxime, ceftazidime and/or a second disc containing cefotaxime + clavulanic acid and ceftazidime + clavulanic acid. A total of 230 urinary isolates were studied over a period of 4 months. Overall, the most common isolate was E. coli (36.52%). Among the Gram-positive isolates, the most predominant isolate was Enterococcus spp. (9.57%), followed by S. aureus (8.7%) and Streptococcus spp. (6.09%). Among the Gram-negative isolates, the predominant isolate was E. coli (36.52%), followed by Klebsiella spp. (17.40%), Citrobacter spp. and Acinetobacter spp. (6.96%), Enterobacter spp. and Pseudomonas spp. (2.6%), Morganella spp. (1.74%), and P. mirabilis (0.9%). One hundred and seventy (73.91%) out of the 230 urinary isolates were sensitive to fosfomycin in our study. Among the Gram-positive isolates, 34 (60.71%) out of 56 isolates were sensitive to fosfomycin, the sensitivity being 70% among S. aureus isolates, 63.63% among Enterococcus spp., and 42.86% among Streptococcus spp. Among the Gram-negative isolates, 136 (78.16%) out of 174 were sensitive to fosfomycin which was higher than other commonly used drugs for UTIs such as imipenem (64.37%), nitrofurantoin (63.22%), norfloxacin (28.74%), and amoxicillin-clavulanate (5.75%). 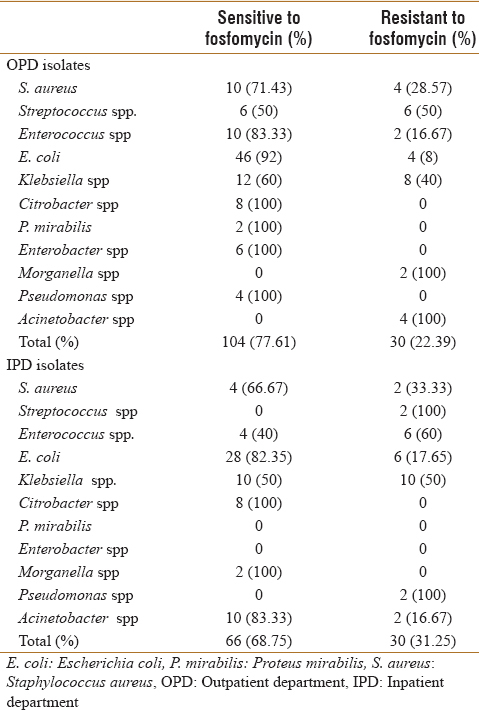 All isolates of Citrobacter spp., Enterobacter spp., and P. mirabilis were sensitive to fosfomycin, while 88.10% of E. coli, 66.67% of Pseudomonas spp., 62.5% of Acinetobacter spp., 55% of Klebsiella spp., and 50% of Morganella spp. were susceptible to the drug [Table 1] and [Table 2]. A study on ESBL-producing E. coli showed all of them to be susceptible to fosfomycin, while 57.14% of ESBL-producing Klebsiella spp. were susceptible to the drug. One hundred and thirty-four (59.13%) isolates were obtained from cases attending the outpatient department (OPD) of our hospital, while 96 (40.87%) isolates were identified from inpatients. Out of 134 OPD isolates, 104 (77.61%) were sensitive to fosfomycin, while out of 96 inpatient department isolates, 66 (68.75%) were sensitive to fosfomycin [Table 1]. We found excellent in vitro susceptibility patterns to almost all urinary isolates except Klebsiella spp. in our study. Clinical studies involving long-term use of fosfomycin to treat UTI as well as other infections have shown that only 3% of various bacterial pathogens have developed resistance to the drug. However, resistance to ESBL-producing strains of K. pneumoniae may arise due to mutation. Our study alarmingly reports 42.86% resistance among ESBL K. pneumoniae isolates even without reported clinical use of the drug in our settings. However, there are several advantages that the drug offers. In vitro synergistic effect of fosfomycin has been observed in combination with ofloxacin and ciprofloxacin particularly against P. aeruginosa. This may be because fosfomycin acts on different synthetic pathways, demonstrating synergy when used in combination a wide variety of antibiotics such as β-lactams, aminoglycosides, macrolides, and tetracyclines. In addition, because fosfomycin acts on synthetic pathways unaffected by other agents, the potential for the development of cross-resistance with other classes of antibiotics is reduced. In addition, in vitro fosfomycin does not react with the negatively charged glycocalyx that surrounds microcolonies of microorganisms in biofilms. Therefore, in vivo fosfomycin may be able to penetrate biofilms and successfully be used in the treatment of infections associated with biofilm formation. Side effects when co-administered, fosfomycin has been shown to reduce aminoglycoside-associated nephrotoxicity and ototoxicity by protecting lysosomal membrane integrity. The most common reported side effects with oral fosfomycin are gastrointestinal (nausea, vomiting, diarrhea, and a transient rise in serum transaminase levels), occurring in only about 2%–8% of cases. Comparison according to Stein clinical and microbiologic cure rates was not different between fosfomycin and nitrofurantoin, and adverse events were not different between the two treatment groups. Fosfomycin presents a reasonable alternative particularly when antimicrobial resistance and patient's allergy preclude the use of first-line agents for UTI. According to Crocchiolo, numerically fosfomycin had higher sustained bacteriologic cure compared to TMP/SMX at 4 weeks after treatment completion. Single-dose fosfomycin for the treatment of uncomplicated UTI in women was similar in efficacy and was more tolerable than ciprofloxacin. Fosfomycin showed excellent in vitro susceptibility to Enterobacteriaceae isolates with advanced resistance to antimicrobial drugs. In our study, we found good susceptibility to fosfomycin in both outdoor and indoor patients prompting single-dose oral regimen even in hospital settings. Falagas et al. found in their study that AmpC producers had lower susceptibility to fosfomycin compared to ESBL producers. This could also be the scenario in our case as most of the Klebsiella isolates were also AmpC producers. In a study by Allerberger and Klare, all VRE isolates were susceptible to fosfomycin showing a promise for the use of this drug while treating VRE isolates. Fosfomycin is a useful alternative to linezolid and quinupristin/dalfopristin particularly in treating UTIs due to VRE strains in certain clinical situations, thus ameliorating resistance emergence among Enterococcus spp. to these agents. The convenience of a single-dose regimen, broad range of activity proven in vitro and in vivo, and minimal propensity for promoting resistant pathogens make fosfomycin an attractive regimen for the treatment of complicated and uncomplicated cystitis. Based on available evidence from other studies on fosfomycin, the clinical efficacy of fosfomycin was comparable to first-line agents for UTI; however, bacterial efficacy was lower. Clinical evidence is still unavailable from well-designed randomized trials for the use of fosfomycin in the treatment of multidrug-resistant pathogens in India. However, given increasing resistance and limited antibiotic choices, fosfomycin can be considered as a first line easy to administer treatment for UTIs as is the case in European countries. This study also reveals an alarming finding of high level of resistance among Klebsiella spp., which could well turn out to be a limiting factor in the clinical usefulness of this drug, but studies have shown a higher degree of clinical efficacy despite in vitro resistance to the drug, which warrants further clinical studies regarding the drug in India. Kahan FM, Kahan JS, Cassidy PJ, Kropp H. The mechanism of action of fosfomycin (phosphonomycin). Ann N Y Acad Sci 1974;235:364-86. Greenwood D, Edwards R, Brown J, Ridout P. The comparative activity of fosfomycin trometamol against organisms isolated from infected urines. Infection 1992;20 Suppl 4:S302-4. Barry AL, Fuchs PC.In vitro susceptibility testing procedures for fosfomycin tromethamine. Antimicrob Agents Chemother 1991;35:1235-8. Naber KG. Fosfomycin trometamol in treatment of uncomplicated lower urinary tract infections in adult women – An overview. Infection 1992;20 Suppl 4:S310-2. Mendoza C, Garcia JM, Llaneza J, Mendez FJ, Hardisson C, Ortiz JM, et al. Plasmid-determined resistance to fosfomycin in Serratia marcescens. Antimicrob Agents Chemother 1980;18:215-9. Arca P, Rico M, Braña AF, Villar CJ, Hardisson C, Suárez JE, et al. Formation of an adduct between fosfomycin and glutathione: A new mechanism of antibiotic resistance in bacteria. Antimicrob Agents Chemother 1988;32:1552-6. Etienne J, Gerbaud G, Courvalin P, Fleurette J. Plasmid-mediated resistance to fosfomycin in Staphylococcus epidermidis. FEMS Microbiol Lett 1989;52:133-7. Reeves DS. Treatment of bacteriuria in pregnancy with single dose fosfomycin trometamol: A review. Infection 1992;20 Suppl 4:S313-6. Principi N, Corda R, Bassetti D, Varese LA, Peratoner L. Fosfomycin trometamol versus netilmicin in children's lower urinary tract infections. Chemotherapy 1990;36 Suppl 1:41-5. Jodal U. The role of fosfomycin trometamol in the management of urinary tract infections in pediatrics. Infection 1992;20 Suppl 4:S317-20. Shrestha NK, Amuh D, Riebel JW, Goldman MP, Tomford JW. Treatment of a complicated vancomycin-resistant enterococcal infection with fosfomycin. Infect Dis Clin Pract 2000;9:368-71. Andåker L, Burman LG, Eklund A, Graffner H, Hansson J, Hellberg R, et al. Fosfomycin/metronidazole compared with doxycycline/metronidazole for the prophylaxis of infection after elective colorectal surgery. A randomised double-blind multicentre trial in 517 patients. Eur J Surg 1992;158:181-5. Andåker L, Höjer H, Kihlström E, Lindhagen J. Stratified duration of prophylactic antimicrobial treatment in emergency abdominal surgery. Metronidazole-fosfomycin vs. Metronidazole-gentamicin in 381 patients. Acta Chir Scand 1987;153:185-92. Collee JG, Marmion BP, Fraser AG, Simmons A. Practical Medical Microbiology. 14th ed., Ch. 7. New Delhi: Elsevier; 2012. p. 13150. Clinical Laboratory Standards Institute. Performance Standards for Antimicrobial Susceptibility Testing: Twenty Fourth Informational Supplement M100-S24. Clinical Laboratory Standards Institute; 2014. Arca P, Reguera G, Hardisson C. Plasmid-encoded fosfomycin resistance in bacteria isolated from the urinary tract in a multicentre survey. J Antimicrob Chemother 1997;40:393-9. Ellington MJ, Livermore DM, Pitt TL, Hall LM, Woodford N. Mutators among CTX-M beta-lactamase-producing Escherichia coli and risk for the emergence of fosfomycin resistance. J Antimicrob Chemother 2006;58:848-52. Takahashi K, Kanno H. Synergistic activities of combinations of beta-lactams, fosfomycin, and tobramycin against Pseudomonas aeruginosa. Antimicrob Agents Chemother 1984;26:789-91. Woodruff HB, Mata JM, Hernandez S, Mochales S, Rodriguez A, Stapley EO. Fosfomycin: Laboratory studies. Chemotherapy 1977;23 Suppl 1:1-22. Kumon H, Tomochika K, Matunaga T, Ogawa M, Ohmori H. A sandwich cup method for the penetration assay of antimicrobial agents through Pseudomonas exopolysaccharides. Microbiol Immunol 1994;38:615-9. Ohtani I, Ohtsuki K, Aikawa T, Sato Y, Anzai T, Ouchi J, et al. Mechanism of protective effect of fosfomycin against aminoglycoside ototoxicity. Auris Nasus Laryn×1984;11:119-24. MacGowan AP, Bailey RA, Egner W, Picken DM, Reeves DS. An open study of the efficacy and safety of single dose fosfomycin trometamol in treatment of hospitalised patients with urinary tract infection (pilot study). Infection 1990;18 Suppl 2:S107-8. Crocchiolo P. Single-dose fosfomycin trometamol versus multiple-dose cotrimoxazole in the treatment of lower urinary tract infections in general practice. Multicenter group of general practitioners. Chemotherapy 1990;36 Suppl 1:37-40. Bozkurt O, Kara C, Akarsu S, Çağlar M, Ünsal A. Comparison efficacy of single dose fosfomycin with ciprofloxacin in the treatment of urinary tract infection in symptomatic women. Turk Urol Derg 2008;34:360-2. Auer S, Wojna A, Hell M. Oral treatment options for ambulatory patients with urinary tract infections caused by extended-spectrum-beta-lactamase-producing Escherichia coli. Antimicrob Agents Chemother 2010;54:4006-8. Pullukcu H, Tasbakan M, Sipahi OR, Yamazhan T, Aydemir S, Ulusoy S, et al. Fosfomycin in the treatment of extended spectrum beta-lactamase-producing Escherichia coli-related lower urinary tract infections. Int J Antimicrob Agents 2007;29:62-5. Rodríguez-Baño J, Alcalá JC, Cisneros JM, Grill F, Oliver A, Horcajada JP, et al. Community infections caused by extended-spectrum beta-lactamase-producing Escherichia coli. Arch Intern Med 2008;168:1897-902. Falagas ME, Kastoris AC, Kapaskelis AM, Karageorgopoulos DE. Fosfomycin for the treatment of multidrug-resistant, including extended-spectrum beta-lactamase producing, Enterobacteriaceae infections: A systematic review. Lancet Infect Dis 2010;10:43-50. Allerberger F, Klare I.In vitro activity of fosfomycin against vancomycin-resistant enterococci. J Antimicrob Chemother 1999;43:211-7.